One of the most powerful ways to engage your community is to get them together face to face. It builds trust and a feeling of belonging. We are social animals, once you shook someone’s hand, your engagement with that person online is on a totally different level. One year coming back from SAP TechEd, I bumped into Matthias Zeller at the airport in Las Vegas. We were both exhausted, but happy, and he said: “You know, TechEd used to be a place where you go and maybe have dinner with your colleague from work. Now, with the SAP Developer Community and their events here, it is like a family reunion”. That is what you want to create with your community, extend the friends and family circle. It is a shame, that afte all these years the community platforms are still mostly lousy in their ability to support events. Ability to allow everyone to post events. Very important for your grassroots local events like the SAP Inside Tracks*. Let members sign up for an event or at least show their interest. Members can copy events to your calendar including location. Integration of other event platforms like MeetUp and Eventbrite. Map integration to get a geo-overview of what is happening where. 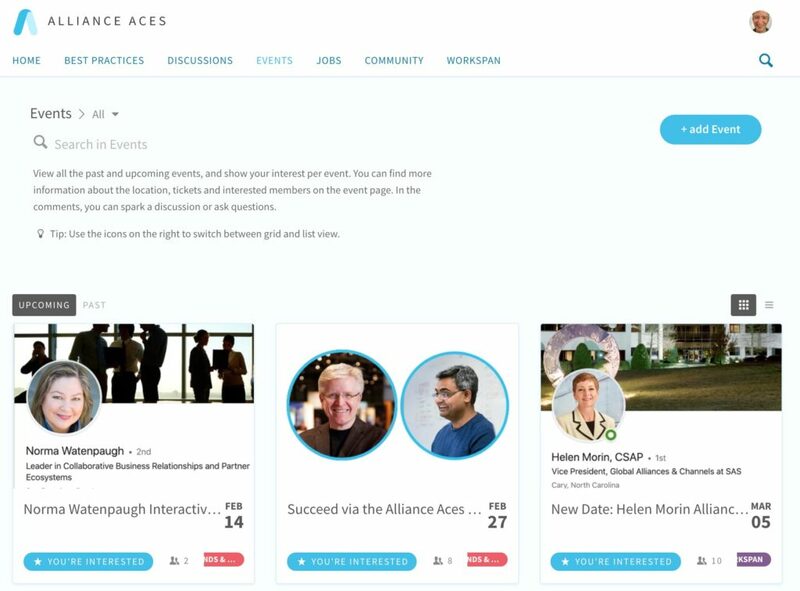 You can check the events at the Alliance Aces Community to get a feeling for it. There are live podcast recordings, interactive webinars, conferences, as well as trainings posted. Some coming from the AAC members themselves. If you want to deepen the engagement of your members, bring them together face to face. When selecting a community platform, keep an eye on their ability to let you and your members create events with ease. *SAP Inside Tracks have a wiki page to organize themselves, which I like as everyone can add their event easily. Still, the platform is lacking many of the event features described above.